Leading with passion, purpose and positivity! Our team are professionals - specially trained facilitators, seasoned musicians, and charismatic entertainers who LOVE what they do! This is obvious AND infectious! We LEAD with passion, purpose and positivity and a sense of professionalism and commitment to customer service and team values unmatched in our industry. Afrobeat is supported by an unbeatable line up of global talent who are not only talented and passionate about building community through music – they are also committed to our values and work ethics, and the creative collaboration, design and development of our programs while maintaining a respect and connection for the culture that inspires it. Industry leaders for 20 years, we’ve developed programs that balance creativity, ownership and personal reward; engaging diverse people and contexts through interactive drumming and dance. We know how to keep an audience entertained, maintaining team focus and momentum. Experts in reading the ‘group dynamic’, our facilitators are able to adapt and reformulate our programs to suit the ‘in-the-moment’ group experience. "Your team absolutely delighted the staff and students with their energy, warmth, spirit and their great skills. It was wonderful to see their magnetic effect on the crowd....the performers instantly generated their trust. Each time we have AFROBEAT people here, they bring a little light and happiness with them"
Following a trip to Africa in 1995, Afrobeat Founder and Principle Facilitator Janine Rew became fascinated with African Rhythms and subsequently studied Traditional Percussion and dance under renowned Master and Culture Keeper A. Epizo Bangoura (who originates from Guinea, West Africa) for 12 years. 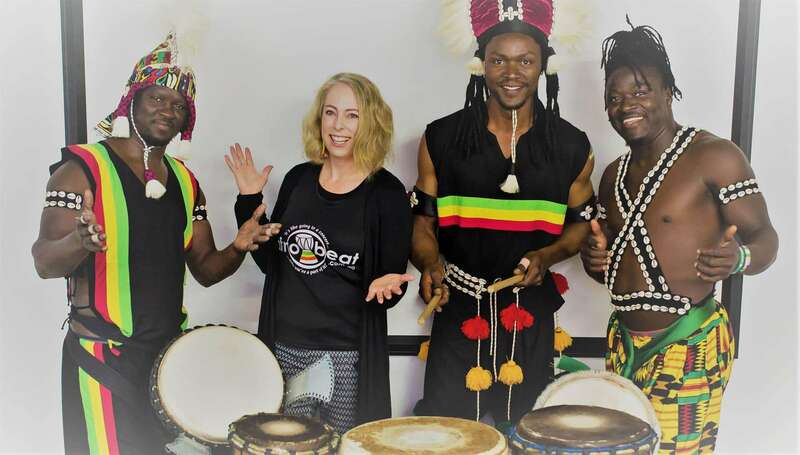 A graduate in interpersonal communications and facilitation, Janine immediately recognised and identified the connections between African Rhythms and their application to group processes, personal growth and community building. A versatile and respected professional, Janine hails from a diverse background of more than 25 years of formal dance training and performance. 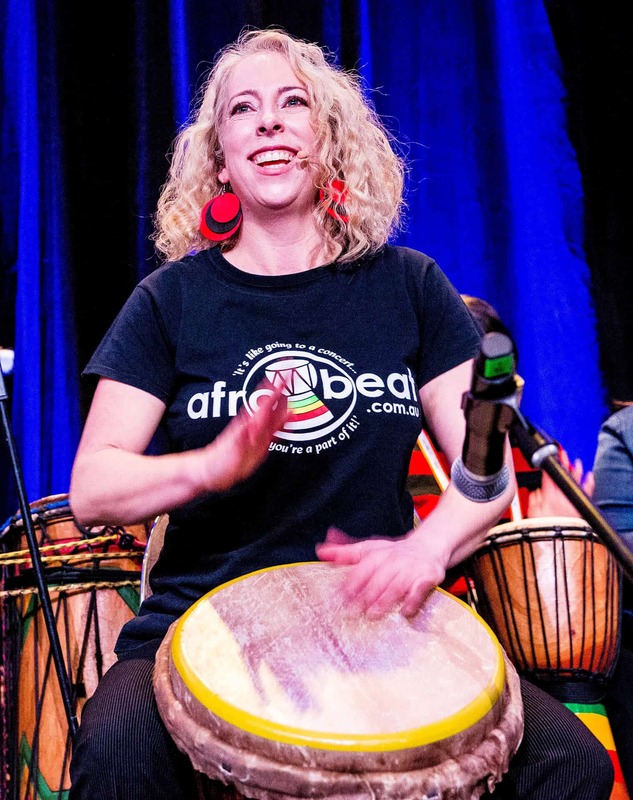 The only female ‘African style’ percussionist to be endorsed by Billy Hydes (Australia’s largest retailer of percussion), she has been instructing individuals and groups in West African percussion and dance technique, and facilitated drumming circles and interactive entertainment with diverse audiences for more than 20 years.